Knitting sock is addicting ! So , i think i have an addiction to sock . I crocheted my first pair of sock before christmas last year . And then i crocheted another pair by the end of the year . In the beginning of the year , i thought i’d like to try to tackle this knitted sock that i see a lot online . I am part of this page , that has some awesome people with creativity . 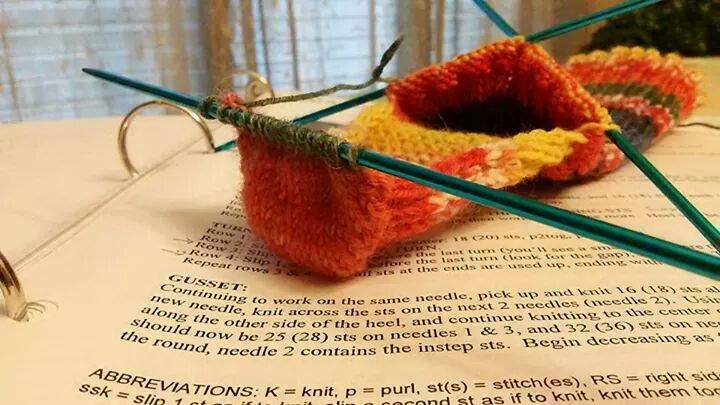 One of them was busy knitting socks , and that’s how i got interested in knitting sock . I am a newbie with knitting since i just learned couple of months ago . 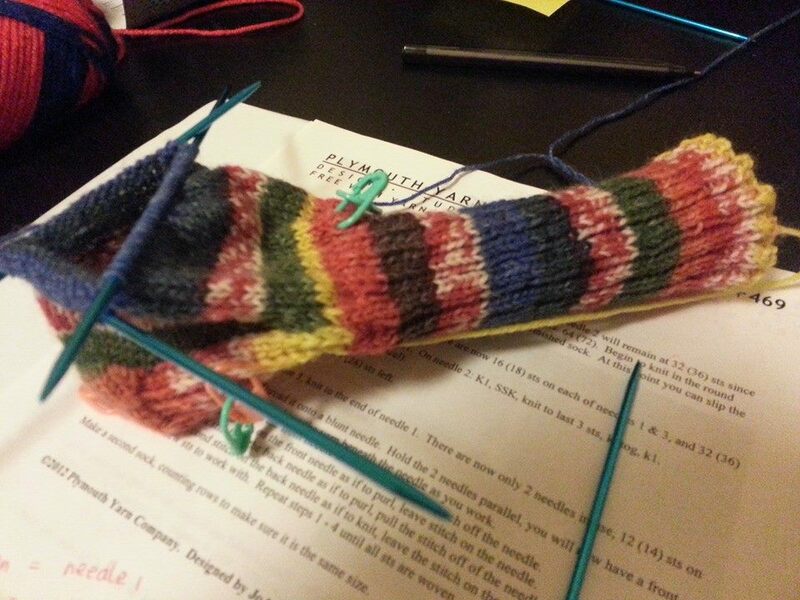 So the thought of knitting socks can be a little far fetched . I in fact , was told , by this lady who worked at Joanne . I had a question back then and another lady sent me to this particular lady by the cutting area because she is the one who supposed to know about needle arts . There i was asking a stupid question actually , a question that i supposed to know anyway . But with how excited i was with the thought of getting started on my knitted sock , i just asked . What size of needle is best for making knitted sock ? She said it depends on the yarn , the information is at the back of the label and i should be able to see whether it’s size 1 or 2 or even 3 . On my hand was size 3 that time . And i was like duh .. i knew this .. why did i even ask anyway . I crochet and i should know in each label that yarn has , it includes the information if you crochet or if you knit , what size of hook or needle you will need . Why did i even ask ? But then she continued asking , are you new to knitting ? I said yes , i just started to learn to knit a month ago . My husband added , she’s been crochetting a while , just started to knit , and wants to make sock . I did not expect that at all .. her words were so discouraging . And i wasn’t like that , even though i hear a lot of words about how complicated socks are , crochet or knit , nobody really said that directly to me . I was surprised – in a bad way . I was very dissapointed with how this lady reacted . She works at the craft store , and i expect people would be more encouraging rather than .. oh don’t do it , it’s too hard , you wouldn’t be able to do it . Why couldn’t she just say .. that’s great , it’s a bit complicated but i am sure you can do it . And i know people can do it , there are so many resources nowadays if you want to learn something , or if you belong to a group , which i do , you can ask for help from these people who are more experienced than you . 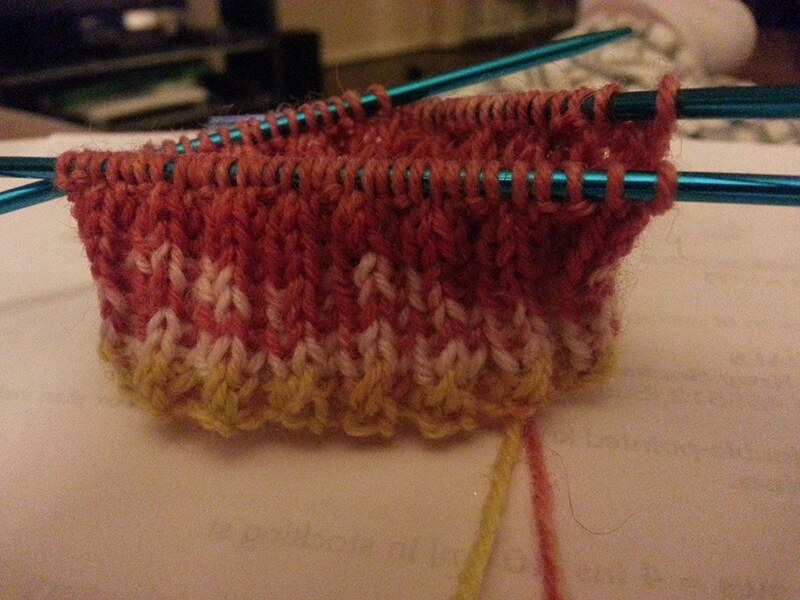 So fast forward a week later , i started my first knitted sock . I was pretty successful , though i picked the wrong needle for it . It was a little too big , so i made 3 socks , the first one was a no go because it’s too big , it fits my husband’s foot though . 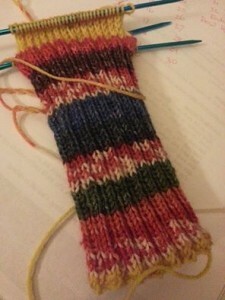 2nd sock and 3rd sock , eventually became a pair , and it was made from worsted weight yarn . 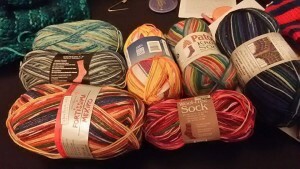 Which is just for a practice , before i am using the real sock yarn . Since that was a success .. These are my little stash of sock yarn .Sock yarn are pretty and they’re expensive compared to regular worsted weight , not to mention if you get it from Local Yarn Store , it is def costs more money than regular chain craft store . And the day after , which is going on to 3rd day , i started turning the heel , made the gusset and finally reaching the instep , which is going to take long to finish before going to the toe .. I have to say , sock takes a long time to knit , it’s because the sock yarn is very fine and very thin compared to worsted weight yarn , and plus you have to use small needles too . So it takes a while , and it is def a labor of love !! !